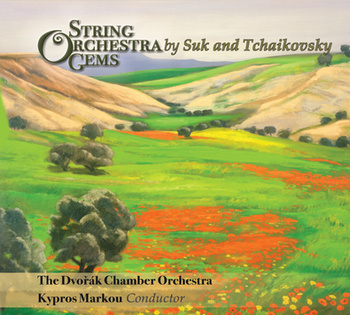 String Orchestra Gems by Suk and Tchaikovsky - Fleur de Son Classics, Ltd. The Russian composer, Pyotr Illitch Tchaikovsky (1840-1893) and the Czech composer Josef Suk (1874-1935)­ were profoundly influenced by their own national identities, even though they are both firmly in the Western European musical tradition. The lives of these two composers overlapped but there is no documentation that they ever met. However they share a mutual connection through Antonin Dvořák, teacher and father-in-law of Suk, and sympathetic colleague and supporter of Tchaikovsky. Dvořák, too, was a nationalist functioning in the Western musical mainstream. Pairing the Tchaikovsky Serenade in C, op. 48 (1880) and Elegy in G Major (1884), both for string orchestra with Suk’s Serenade in Eb, op. 6 (1892) and his lesser-known “Meditation on an Old Czech Hymn, Svaty Vaclave (St. Wenceslaus),” op. 35a (1914) offers a fresh look at the musical thinking of two Slavic composers.